Savings: More than 40% in construction cost and time . 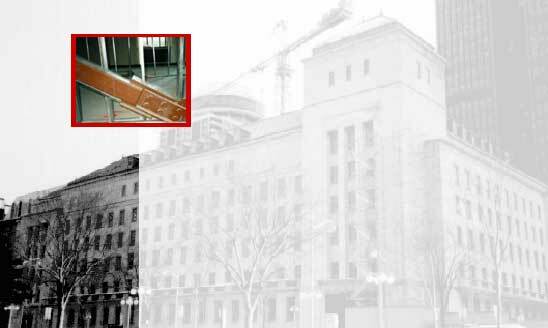 This eight-storey concrete frame building is located in Canada's parliamentary district. It was built in 1955 as a memorial to the Canadians killed during the Second World War. The stone clad building, with sloping copper roof, has been designated a heritage structure. The existing structure was not capable of resisting seismic forces specified in the Building Code. In 1997, seismic rehabilitation was undertaken along with major renovations to protect the original and new investment. Pall Friction Dampers offered the best solution for the seismic upgrade. Since the dampers dissipate a major portion of the seismic energy, forces acting on the structure are considerably reduced. By staggering the bracing at different storey levels, overloading of columns and foundations was avoided. Hence, expensive and time-consuming work of strengthening existing members and foundations was not required. Unlike shearwalls, the friction-damped bracing need not be vertically continuous. This aspect was particularly appealing to the architects as it offered flexibility in space planning. This structural solution also facilitated construction scheduling as work could start at any floor level, depending on vacancy or availability.